We crossed the Swiss-German border at sundown. “Ummmmm, staying in a hotel….” (don’t worry about it). OK I’m in…. Back in Germany for the evening. I thought I’m in Europe and there’s no borders… “except for Switzerland”… Full check point hasslings. I drop my VW van off in the parking lot and get in the car. Back on the road… heading north. It’s snowing katzen und hunde. 45 minutes later, we (myself, Bertrand Trichet and Lars Griewe) arrive at a supermarket in Frieburg, southern Germany and stock up on beers, cheese and desert. We head out to Pudi’s place, which is in a tiny town of 40 houses in the middle of nowhere. An ancient castle leans over like Piza on the hillside. We arrive at a quaint house with a large barn in the back. Pudi, aka Axel Görger awaits and cooks us homemade pizza. We look through his killer hand printed photos from Mälmo, Sweden, ditches in Germany, concrete construction and old film school photo storyboard portfolios. Dinner has settled and it’s time to see the barn ramp. 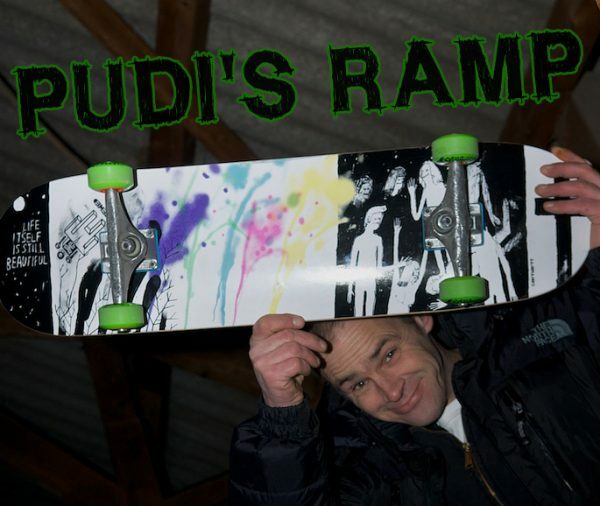 Pudi is an eccentric dude that builds his own snowboards to ride in the nearby hills, and among other things, he makes his own Pool Coping. 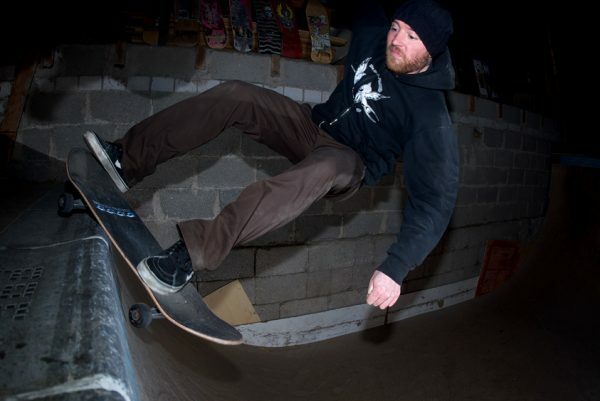 PPD – Pudi’s Pool Coping. They use his pool coping in the bowl in the Skateboard Museum in Stuttgart that Minus built. 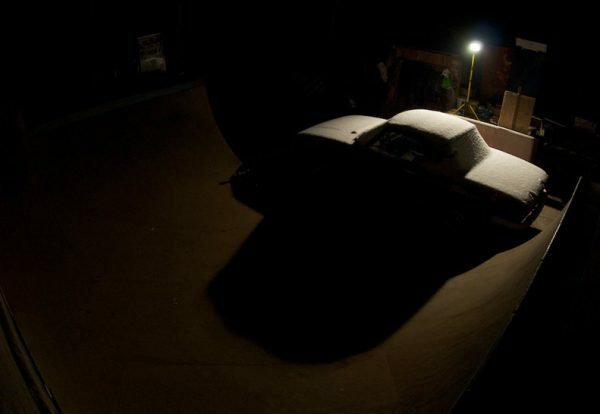 In the winter, the weather is too cold for the concrete to set, but not too cold (even in the snow) to skate it! Pudi is lucky to have his own personal pain machine in his barn behind his house – a privilege few can claim. 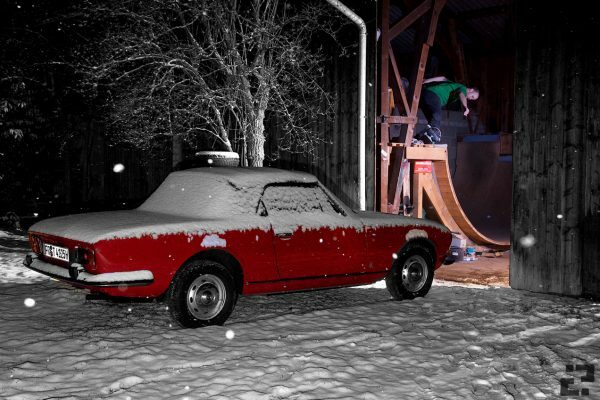 Bertrand, Lars, and Pudi were ripping up the ramp for close to an hour and then we went inside to warm up, have a couple drinks, and then hit the snow covered unplowed roads back to Basel, Switzerland. A success of sorts, a failure of others (but only because I tweaked my knee for the next months to come). A little self promotion never hurt? Well this time it did. Torn knee 5 minutes before we got the front side grind photo. All's well that ends well ? ?